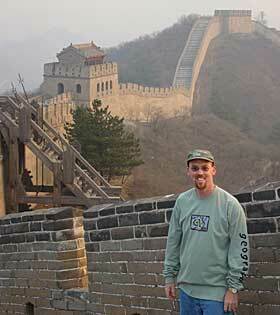 Ray L. Chilcote, spatial database administrator, North Carolina Department of Transportation GIS Department, took his Esri T-shirt halfway around the world to the Great Wall of China just to snap this picture. Another good reason to have been there was to bring home his adopted daughter! Leane Welsh, GIS/GPS technician, Westfield Public Works, Westfield, Indiana, visited Chongqing, China, in June 2007 as part of a group from A Child's Right (www.a-childs-right.org) to install a UV water filtration system at Qianjiang Orphanage where her daughter Katie lived before she was adopted. She also brought along an Esri T-shirt! 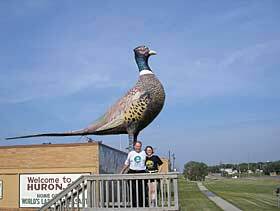 While on vacation, Mark Sloan, GIS coordinator, Clay County, Michigan, and his wife Jocelyn stood below the world's largest pheasant in Huron, South Dakota. She is wearing the Esri T-shirt. He is wearing a very "green" Earth Day shirt. Over the years, Michael Szuflita, Management Information Systems and GIS Department, New York City, New York, Parks and Recreation, has posed all around the United States with Esri T-shirts, showing off his link to the GIS world (believe it or not, this was before a coworker showed him our T-shirt feature and urged him to submit some). 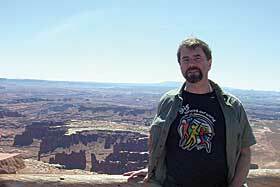 Behind him in this shot, all the way to the horizon, is Canyonlands National Park in Utah. Hey . . . T-Shirts Aren't Everything! 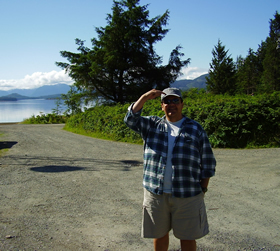 Shawn Headley, GIS specialist, Campbell Timberland Management, Fort Bragg, California, was encouraged by coworkers to submit this photo. It's not quite a T-Shirt . . . but it is an official Esri User Conference bag. 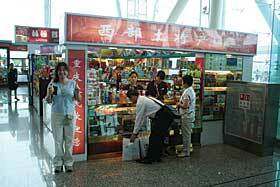 He says, "I use it to go to the farmer's market to buy fruits and veggies. 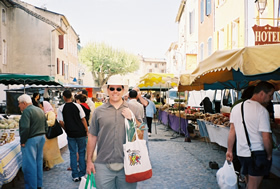 This photo is of me in the small town of Buis les Baronnies nestled in the foothills of the Alps in southern France." George Brady, supervising land surveyor, San Diego County Water Authority, and his colleagues Sari Sibayak (left) and Hassan Teluk Dalam (right) were on board the vessel Ailiotta II. off the Telos Islands of northern Sumatra. Their objective was to study coral reef uplift related to the 2004 earthquake and resulting tsunami and its effect on recreational activities in the area. Naturally, they packed their Esri T-shirts first thing!